3 Fonteinen Oude Kriek is the result of macerating hand-picked whole sour cherries on young lambic for at least four months, in a proportion of one kilogram of fruit per litre of lambic. 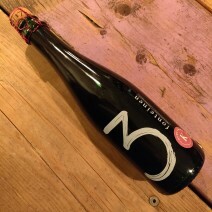 The kriek lambic is then blended again with more young lambic to obtain a minimum intensity of 35% fruit, and is bottled immediately afterwards. These bottles are then stored in our cellars for at least five months so that the kriek lambic can develop into a beautiful, traditional, and refined Oude Kriek.